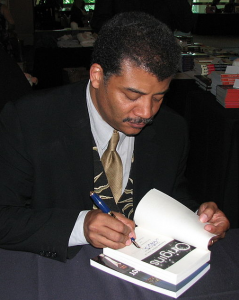 Challenging the insularity of academic research is important for all fields, including the human sciences, as Kelly Baker writes in her recent post about Neil deGrasse Tyson. This departmental blog, and several others where faculty in the department publish (Culture on the Edge, Huffington Post, Bulletin for the Study of Religion, Thinking Out Loud . . .), are an aspect of this process of making scholarship accessible to a wider audience, as these sites attract non-academic readers, no matter how widely each author conceives the audience. Of course, helping non-specialists engage difficult concepts is what professors do continually in the classroom. This call to be more accessible, however, overlooks an important point. Tyson could not do what he does effectively without the reams of difficult research and hard to digest material that he and his colleagues have produced. Tyson, and all of us, stand on the shoulders of many other scholars whose work was not always easily accessible. My own reflections on identifications and critiques of various labels (like the Nones) develop out of my reading of detailed historical research on violence and conflict in India in the nineteenth century as well as research on the category “religion” and “world religions” within the academic study of religion. The move to be accessible — while vital in many ways — hides all of those scholars on whose shoulders I stand. That can be a danger. If we privilege the immediate gratification of research that is relevant and accessible today, then society loses future benefits that we cannot imagine from specialized and often abstract research. So any call for more accessible scholarship needs to be balanced by a recognition that future accessible scholarship will thrive only if we value the obtuse, detailed, and specialized work alongside the accessible, publicly focused presentations of such research. Both are needed. Dr. Baker’s argument that these accessible moments are not simply a natural talent that some people have is vital to recognize. They require preparation, practice, and lots of hard work. While it appears to come easily to Tyson, that ease disguises significant labor. Talking to a broader audience without trivializing is not typically easier; it takes much work and preparation to move beyond the ivory tower and not lose the complexity that makes the research significant yet often difficult. Such work certainly should be valued more within reviews of academic performance, along with the specialized research. These skills are also something that students should develop. This semester I have begun working with seminar students to present more abstract theoretical points in an engaging and accessible manner, using contemporary popular culture and current events as examples. (Their efforts appear on this blog regularly.) Students have at times found the process challenging, but their improvement suggests that the process is worthwhile. So we must not forget the hard work that goes into both presenting to a broad audience with ease and the inaccessible, specialized research that later makes accessible presentations possible. This entry was posted in Faculty Blog, Relevance of Humanities and tagged Accessibility, Blogs, Kelly Baker, Neil deGrasse Tyson, Relevance, Scholarship, Steven Ramey by Steven Ramey. Bookmark the permalink.